Obvously these total positions changed with speculators’ collective sentiment. 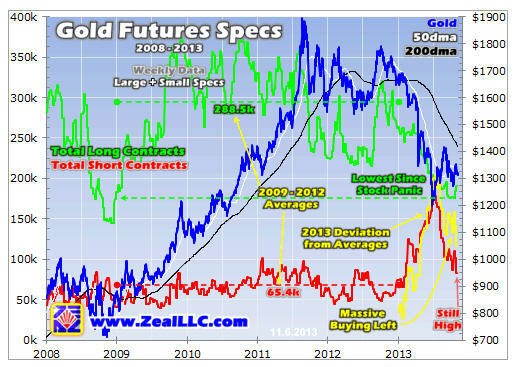 Longs rose and shorts fell when they grew more bullish on gold, and the opposite when they waxed more bearish. But all of this normal market activity, the usual flow and ebb of uplegs and corrections, is distilled into these baseline averages. The sharp contrast between them and what we’ve seen this year really highlights 2013’s extremes. 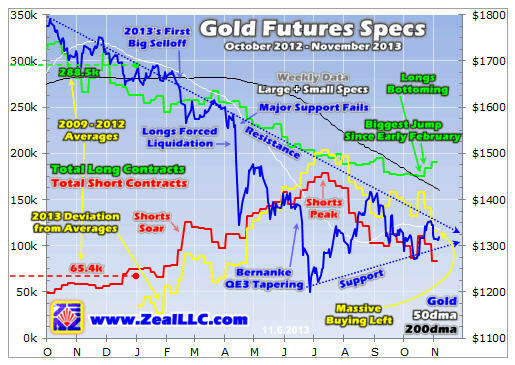 If y0u want to stay abreast of this exciting gold-mean-reversion process and earn big profits, you need an expert contrarian source of analysis. The mainstream media won’t cover it until the lion’s share of the gains in gold, silver, and their miners’ stocks have already been won. So you really ought to join us at Zeal, the speculation and investment company I founded 14 years ago to do market research to help contrarians thrive.